In my last couple of posts I talked about my buddy Sherman's quest for his ultimate Les Paul. And I was surprised when he told me someone on one of the guitar forums was selling a Sid Poole Les Paul! 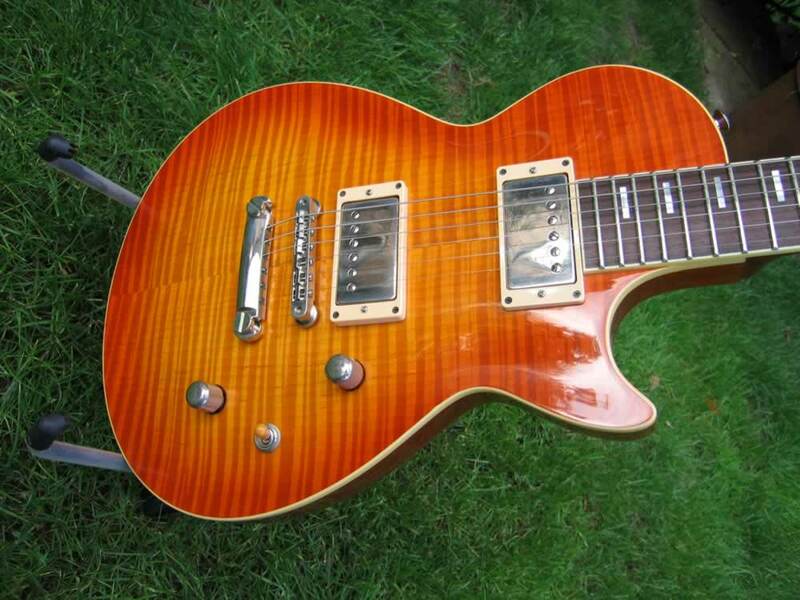 Another guitar collector friend of mine had bought a Poole Les Paul off of Bernie Marsden in 1998. His story was that he was in the UK for business where he happened upon a blues festival featuring Marsden's band. So enamoured was he with the tone of Marsden's Poole that he offered him top dollar for it right after the show. Pretty crazy I know, but that's the story. And I've seen and played that Poole guitar myself. And it was through this same collector friend that I met Sid Poole in Singapore in 1999. Over dinner in an Indian restaurant (Sid's preference), the three of us spent about two hours talking guitars. I remember him mentioning how he started out building 1959 Les Paul replicas for a select clientele in the UK, and the subsequent 'Cease and Desist' letters from Gibson that followed. Changing the headstock design and putting his own name on it didn't stop his customers from coming back, however. Sid was a really good bloke. Sadly, he passed away a couple of years later in 2001. 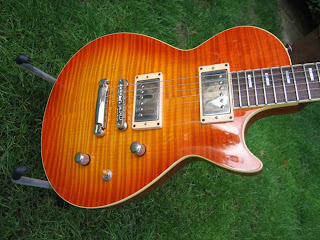 The Marsden-owned Poole became a benchmark for me as to what a great Les Paul could be -- or should be. Light and resonant, the whole guitar seems alive in your hands. Heck, when I played it sitting down I could hear the fabric of my jeans rustling against the thin nitrocellulose finish through the amplifier! And the Tom Holmes humbucking pickups perfectly complemented the instrument giving an airy twang without a hint of a mud. Everything I would imagine an authentic 1959 Les Paul to be. Finish off the whole deal with a stunning quilted maple top and you had what was basically, quintessential Sid Poole. The only thing missing was the familiar headstock with every guitar player's favorite bluechip 'G' brand. I swear, if someone were to scarf-join a Gibson headstock onto a heavily flamed Epiphone Les Paul some mook will gladly fork out big bucks for it. And where is Epiphone getting all that amazing flame maple for their tops anyway? 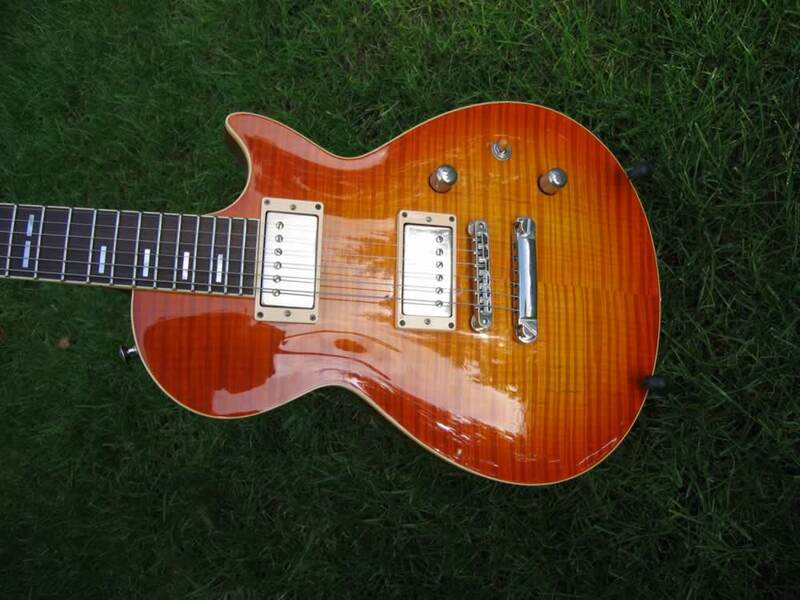 When Sherman sent me the pics of the Poole Les Paul he was considering, certain alarm bells went off. It looked like a decidedly new guitar and didn't have the vibe of an original Sid Poole-built guitar. A quick search revealed a Poole successor of sorts who was custom building guitars and this particular axe appears to be one of them. The seller wanted about $2200 for it, well below what an original Poole would go for these days. If you were lucky enough to find one. For Sherman, the quest continues. Check out Part 1 and Part 2 of The Les Paul Quest. And take a gander at the Poole Custom Guitars site. Besides their standard models, they're also building guitars to custom specifications. Hi there, without seeing the headstock I would say that looks like A Sid Poole Custom Classic - I think he made 6 of these when Gibson asked him to stop copying a certain guitar. It does look like an authentic Sid. I saw one or two in the flesh, and I think one of the guitar mags reviewed one. I have a Sid Poole Les Paul replica myself, made in 1996. Sid was a lovely bloke.